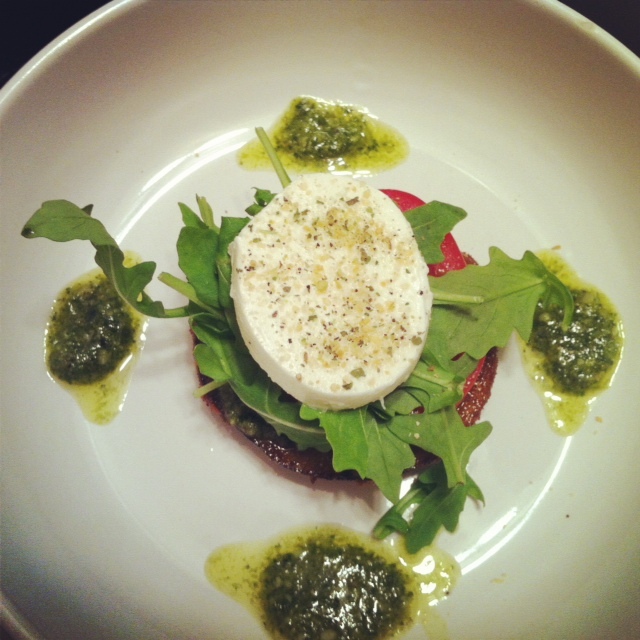 You are here: Home » Caprese reinvented…. This recipe involves no meat (sorry, you meat loving men) but is still hearty due to the….wait for it…… eggplant. Eggplant?? Yes! In order to add some more substance to this appetizer and transform it into a main course I decided to add pan-fried eggplant. Also, instead of fresh basil leaves I used some homemade pesto. This can still be used as an appetizer or as an entrée for Meatless Monday! You need to get the water out of the eggplant. You can do this by salting the slices heavily with coarse kosher salt and letting them sit for 15 minutes. Make sure to wipe off the water and salt and do the same to the other side. Pat them dry with paper towels. Dredge your eggplant slices in the beaten egg and coat with breadcrumbs. Heat up your oil very hot and fry the eggplant slices until golden brown. Place on a paper towled plate to soak up the excess oil.